Ganondorf, The King of Evil is Link’s arch-nemesis in most games in The Legend of Zelda™ series. As the embodiment of all evil, Ganondorf seeks to take control of Hyrule. He plundered a piece of the sacred Triforce from the Temple of Time when Link pulled the Master Sword from its pedestal. With the Triforce of Power in Ganondorf’s possession, Hyrule was plunged into darkness until Link™ and Zelda™ defeated the fiend. The King of Evil’s arsenal of moves is as deadly as they come, as he has many powerful tools to work with. His most famous (or infamous, depending on who you ask) move is Flame Choke, a command grab that bypasses an opponent’s shield and deals heavy damage. Foes caught by this move are forced to the ground, leaving them open to Ganondorf’s down or forward tilt for even more damage. These two tilts, alongside his jab, possess great power and knockback and are some of Ganondorf’s fastest moves. His smash attacks are some of the most powerful of their kind, all with extremely high KO potential – forward smash in particular has the power to break shields even when uncharged! His special moves, while not as spectacular as his smash attacks and tilts (barring Flame Choke, of course), also have good KO potential; his down special, Wizard’s Foot, is his second most reliable special attack and approach option. Finally, Ganondorf is a heavyweight, making him a bulky and resilient fighter. Unfortunately, Ganondorf is held back by a few (albeit minor) flaws that could possibly hinder his battlefield prowess. 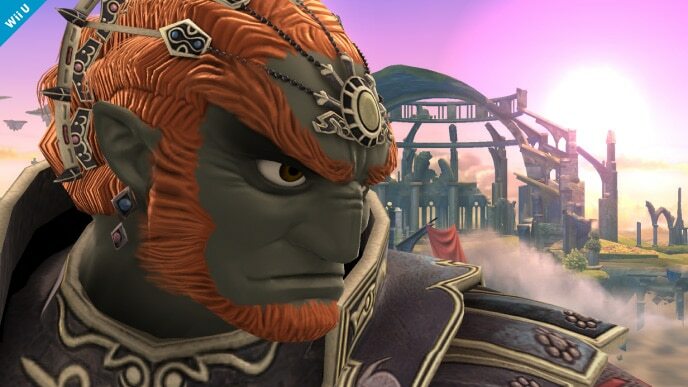 His smash attacks, while powerful, are quite slow, meaning they can be dodged or shielded with the right timing, but this problem is easily circumvented by teaching Ganondorf to rely on his tilts for damage. His recovery is another problem: neither his jump nor his up special grant much height. Ganondorf’s large and slow frame is quite possibly his biggest problem, however – he’s easily caught in jab combos from the likes of Link, Luigi, Pac-Man, and just about any other fighter with a quick jab. Ganondorf’s numerous strengths definitely outweigh his weaknesses, and he’ll likely become one of, if not the best amiibo in your collection. He requires a bit of training to perfect, but once he reaches Level 50, you’ll see for yourself why he’s one of the most feared characters in the competitive metagame. Warlock Blade: This is a custom move version of Ganondorf’s neutral special, Warlock Punch. 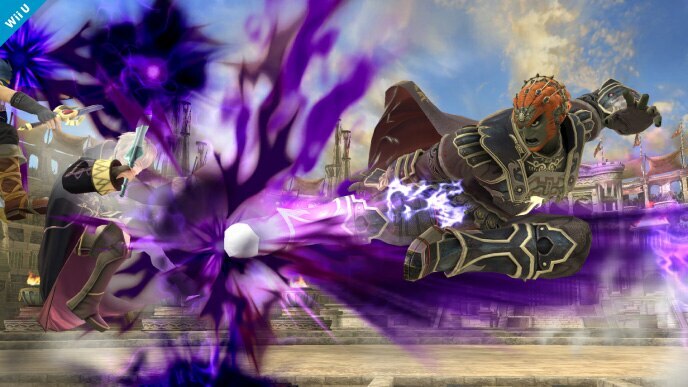 It’s one of the coolest custom moves available: instead of a punch, Ganondorf strikes with the Sword of Sages! It deals less damage overall, but has enhanced range and can shatter a full shield. 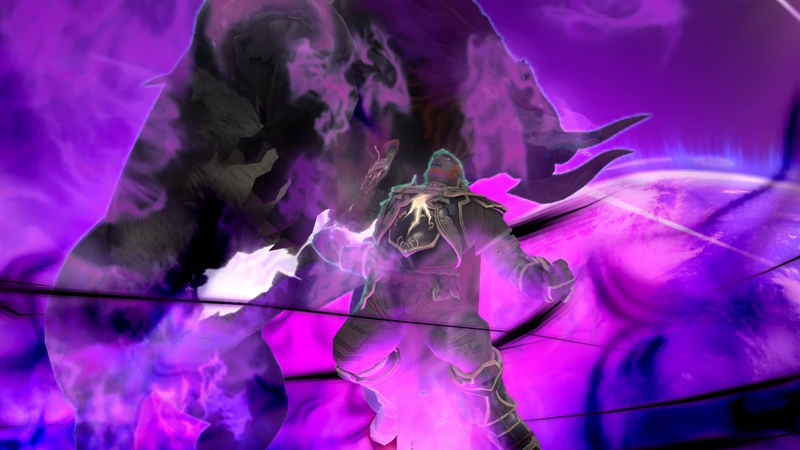 Dark Fists: This is a custom move version of Ganondorf’s up special, Dark Dive. Dark Fists grants super armor during startup and has enhanced KO power. The super armor prevents Ganondorf from being gimped offstage by projectiles from opponents like Mario, Link, and King Dedede. Neutral options: jab, forward tilt, down tilt, and side special. 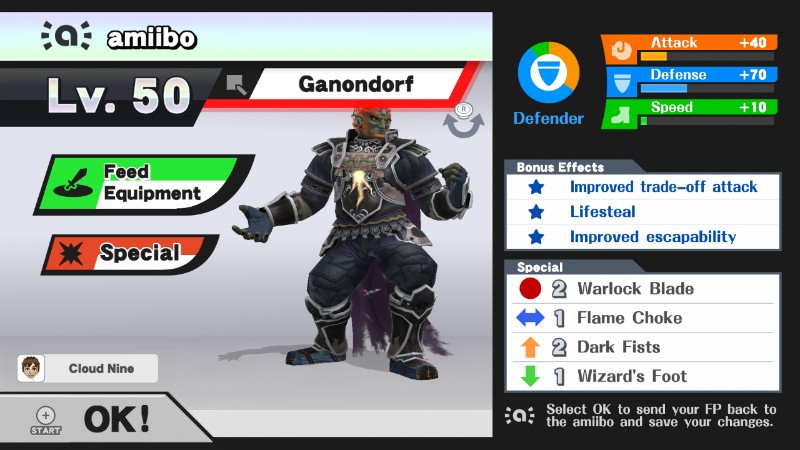 Ganondorf’s jab and forward tilt are his fastest options for quickly racking up damage. His side special, Flame Choke, is perhaps his best neutral attack – it true combos into a down tilt to inflict major damage and knockback. Be sure to use jabs, forward tilts, and Flame Choke combos during your training. Main KO moves: forward smash, up smash, and side special. Each one of Ganondorf’s smash attacks is extraordinarily powerful: his forward smash, while slow, can net early KOs; up smash, on the other hand, is a perfect blend of power and speed and serves as Ganondorf’s most reliable KO option. Flame Choke into down tilt is another option that can bypass shields. Thanks to Arklaine for compiling Ganondorf’s information. Images are courtesy of SmashWiki and the official Super Smash Bros. website.